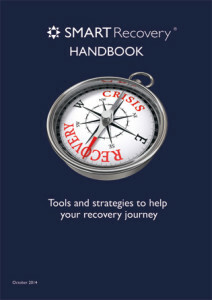 This is the 3rd edition of the SMART Recovery Handbook, edited specifically for the UK. It will be useful to meeting participants who want a stronger understanding of the ideas and tools used in SMART Recovery, and includes most of the hand-outs and written exercises we use in meetings. Most people will not read this Handbook from cover to cover, but rather use it as a topic-by-topic reference to answer questions as they move through their recovery journey. The worksheets can be freely photocopied by Facilitators to use in meetings. Champions who are currently running meetings. If you are interested in a bulk order please get in touch with central office to discuss discounts.